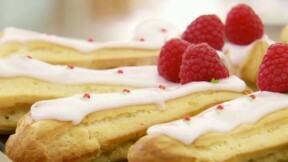 Nancy's raspberry ripple eclairs recipe is featured in the "Pastries" episode of The Great British Baking Show. For the raspberry coulis, put all the ingredients in a small saucepan and bring to the boil. Once bubbling, turn the heat down and simmer for five minutes. Strain through a fine sieve to remove the seeds. Tip the strained juice into a bowl and set aside to cool before refrigerating. For the crème pâtissiére, in a bowl whisk the egg yolks and sugar together. Stir in the cornflour. In a pan bring the milk and vanilla extract to the boil, then slowly pour it over the egg mixture whisking all the time. Return the mixture to the milk pan, set over a medium heat and whisk constantly for 1-2 minutes, or until thick. . Remove from the heat then gradually whisk in the butter until you have a thick glossy sauce. Transfer to a clean bowl and cover the surface with cling film to avoid a skin forming. Allow to cool then place in the fridge until ready to use. For the choux pastry, preheat the oven to 200C/400F/Gas 6. Gently heat 150ml (5½fl oz) water, the butter and salt in a medium saucepan until melted, then bring to the boil. Sift the flour into a bowl then tip it into the pan of boiling butter and water. Remove from the heat and, using a wooden spoon, very quickly beat the mixture until smooth. Return the pan to the heat and continue to beat the mixture until you have a smooth paste. Return the dough to the bowl and add the beaten eggs gradually, until the mixture has a smooth dropping consistency (the dough should hold onto the spoon but drop off when lightly tapped on the edge of the bowl). Spoon the dough into a large piping bag fitted with a 1cm (½in) plain nozzle. Line two baking trays with non-stick silicone parchment and mark six 13cm/5in lines on each piece of parchment, leaving as much room as possible between each line. Spray the parchment with water and pipe identical tubes of dough on the lines. Bake for 20 minutes, or until well risen and golden-brown. For the Chantilly cream, whip the cream until soft peaks form when the whisk is removed. Whisk in the icing sugar and vanilla extract. Spoon the mixture into a piping bag fitted with a 5mm/¼in nozzle or an icing syringe. Using the tip of a small sharp knife make three holes in the underside of each éclair. Neatly inject the rippled cream into each hole to fill the éclairs. For the fondant icing, with a handheld electric mixer, beat the fondant icing sugar in a wide bowl with enough cooled syrup to make a smooth icing which holds soft peaks when the beaters are removed. Set aside about two tablespoons in another bowl and color it red using a little of the gel food coloring. Spread the top of each éclair with a spoonful of white icing. Use a wet finger to straighten and smooth the edges to create a neat finish. The fondant should stay in place – if it is too runny add more icing sugar. Place three fresh raspberries on the top of each éclair and use the red icing to decorate. Serve the éclairs as soon as the icing is completely set.